Have you ever tried silken tofu? I first learned about it from Mark Bittman, who used it in a pudding recipe for the New York Times. Unlike the tofu that you may be more familiar with, silken tofu has a soft, smooth texture like custard and can be used as a dairy substitute. Bittman's recipe made me very curious to try it, but I'm not a huge fan of pudding, so I never got around to it. Then recently, Emily of A Cambridge Story used it to make a pasta casserole with alfredo sauce. 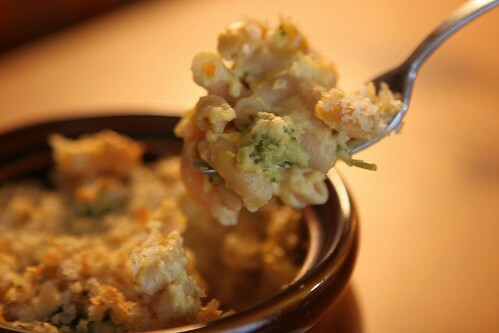 When I saw her recipe, I knew that I wanted to do something similar to create a healthier version of mac 'n cheese (maybe healthified mac 'n cheese will become a whole category on this blog. I've already got this one). The sauce in this recipe is made of silken tofu, carrots, garlic and some smoked Gouda cheese. That's it. No butter, no milk, no cream. The tofu really gives it a velvety smooth texture that just feels creamy, and the carrots give it some good cheesy color. The smoked Gouda adds tons of flavor - Andrew even thought there was bacon in this dish. I have to admit that I get a big kick out of sneaky uses for vegetables and healthy ingredients, so I really had fun with this =). Do you have any tricks for sneaking vegetables or other healthy ingredients into recipes? 12 oz. carrots, peeled and sliced into thick coins. 8 oz. broccoli florets, cut into small pieces. Steam carrots until tender, about 30 minutes. Transfer carrots to the bowl of a food processor, and put broccoli florets in the steamer basket. Steam broccoli until tender but not mushy, about 10 minutes. Remove broccoli and set aside. Preheat oven to 375 deg F. Bring a pot of well-salted water to a boil and cook macaroni until al dente. Reserve 1/2 cup of the pasta cooking water and then drain the pasta. Blend carrots, tofu, and garlic in the food processor until mixture is very smooth. Transfer tofu mixture to the pot that you used to cook the pasta. Add 1/4 cup of the pasta cooking water and bring mixture to a simmer over medium heat. Stir in the cheese and cook until cheese is melted, then remove sauce from heat. Salt sauce to taste and add more pasta cooking water if it seems too thick. Stir the macaroni and broccoli into the sauce. 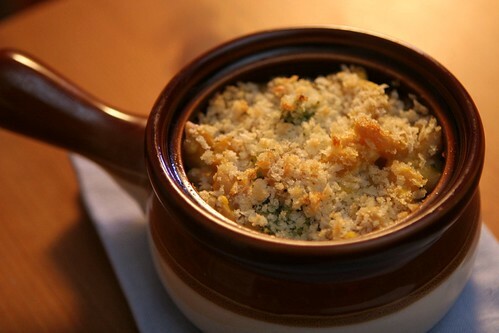 Transfer the mixture to a large baking dish or gratin dish (or individual baking dishes) and sprinkle panko bread crumbs on top. Spray the crumbs lightly with cooking spray, and bake the mixture uncovered in the preheated oven until sauce is bubbling and crumbs are golden brown, about 20-25 minutes. Serve immediately. I usually try to sneak some sort of veggie into macaroni and cheese...sometimes cauliflower or broccoli, but usually butternut squash puree. I like your new crock dishes. I have some of those and don't think to use them often for non-soup foods. Awesome!! Isn't the texture achieved by silken tofu + a hint of hearty cheese amazing? This sounds like a must-make dish! Shockingly I have never made homemade mac and cheese. I really need to and it'll totally be stocked with veggies. I hear so many people using silken tofu to make amazing things like mousse and now your fantastic mac n cheese. It looks great! I've never tried silken tofu but you've now peaked my curiosity- looks great! I sneak kale into everything, especially into veggie soups and especially into pureed veggie soups! My boyfriend's not really a fan of kale, but it's so good for you and is the healthiest local winter crop, so I always have it around. It's become my personal mission to sneak it in wherever I can! My granddaughter use's Silken Tofu alot so I thought I would surprise her and make a dish with Silken Tofu, never too old to learn new things and this Silken Tofu Mac n Cheese sound's wondrful. Oh my word. What an amazing combination, I HAVE to make this!